Studying as a Jaffy first-year student is not easy. From the expectations to listen and understand most, if not all the lectures, the assignments that you have to hand in before its due (and the notion that you’re still working on it creeping up to you everyday until you hand it in), and the readings/problem booklet/quizzes that tries to trip challenge you and other classmates every week or so, more than once I felt that I was at the brink of crashing and burning. Fortunately, I’m always reminded of a little something I saw on the ad board in the Union House at the beginning of the semester. 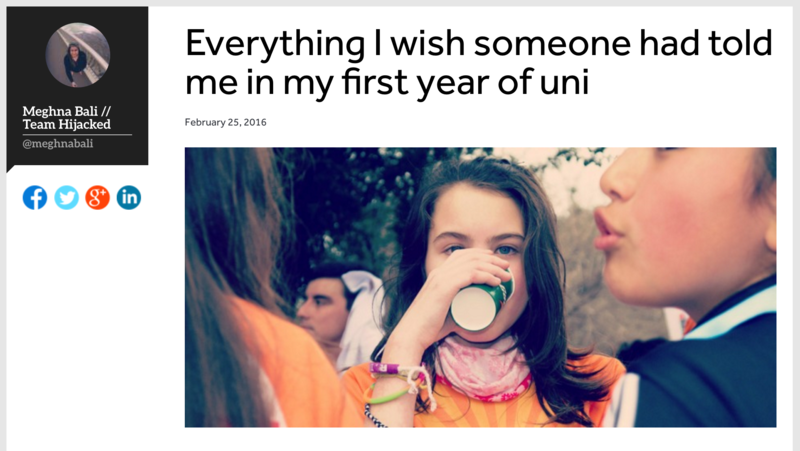 It was a promotion to an article on Hijacked (you can read it here if you’re curious), stating a few things the author wish she’d knew in the first-year of uni. Looking at it, some of you may dismiss it as an obvious set of facts, but one of them in particular needed a bit of a refresher in my head. I’d admit back in high school I wasn’t the most popular, or perhaps the most likeable, nor even the type most people would feel sorry for having very few friends. However, in uni the hordes of other students and staff (apart from a select few of my old schoolmates that happened to go the Melbourne as well) literally don’t know about you, which while putting you apart from them, helps you start on a level playing field since they have no idea of who you were before. First-week tutorials gave ample opportunities for me to have a sip of who I can work with and start sticking with people I feel comfortable around. Aside from the group study sessions I occasionally organise with my subject classmates, some of them eventually proved very useful in helping me get through the piling work. Now, I communicate with one of my tutor classmates weekly to get through small assessments together, and meet with some friends from the math department to work together on math problems/assignments. Chat tools like Facebook, Slack and WhatsApp make it super-easy to co-ordinate amongst friends, and should one or more of them be unavailable, its not that hard to find another willing person to help/work together with, as it is still a very large campus. The best part? I get to also give back in whatever I can (help others out in their assignments/work) and make new friends, more than I made in high school, without any repercussions from the past. As the article says, you get a clean slate. Why not fill in some good stuff if you haven’t yet? I love the idea of making the most of a clean slate. Great message and great work! I think the key point too is that you’re not in a familiar, controlled environment anymore. You don’t go outside, see all your friends and play downfall with them every day at 1pm on the dot like you did at high school. You have to go out and find friends and organise to meet up with them for lunch if you don’t want to be lonely! Sounds like you’ve been doing a great job of it Eyre!